EdustarAsia (EDS) Tuition Agency (Reg no: 53336784X) is a Singapore-registered educational service provider, established with the objective of providing quality educational services in Singapore. Currently, EdustarAsia's main business focus is in providing quality home tuition services. Our aim is to connect students with quality, experienced tutors at affordable prices. To date, EdustarAsia has a database of over 30,000 tutors comprising of full-time professors, lecturers, school teachers, graduates, undergradruates, etc, to cater to the needs of students of different levels and financial abilities. Furthermore, to put our clients' mind at rest, we request every tutor to produce his or her certificates to our clients on the first day of tutoring. Affordability: We understand that the cost of living in Singapore is rather high and hence we don’t believe in paying exorbitant prices for tuition. We want to lighten the financial burdens of students and their parents. Thus, we always try to negotiate the best deal possible for our clients, and at the same time, not compromising on the standards of the tutors. Follow-up service: We always believe in ensuring customer satisfaction. Hence, our clients are always welcome to feedback any dissatisfaction they have with their tutors and we will do a replacement for them immediately. Efficiency: EdustarAsia is committed to find the right tutor for our clients in the shortest possible time. We care: EdustarAsia treats each tuition recommendation as more than just a business transaction. We want every client to be satisfied with our service and we want to build a long-term relationship with everyone of you. Hence, we are always approachable and welcome any enquiries relating to tuition or the educational system in Singapore. Click here to get a tutor now!!!!! Start your own tuition Agency at low cost!! Join us as EdustarAsia Tuition Coordinator today! Dear customer, please download this flyer for reference. "I have just registered with EdustarAsia and I am really impressed with their efficiency. They managed to get me a tutor within 1 hour and what's more, after 1 lesson, they called me to get my feedback and offered to get a replacement for me if needed. Totally amazed by their service. Thanks!" 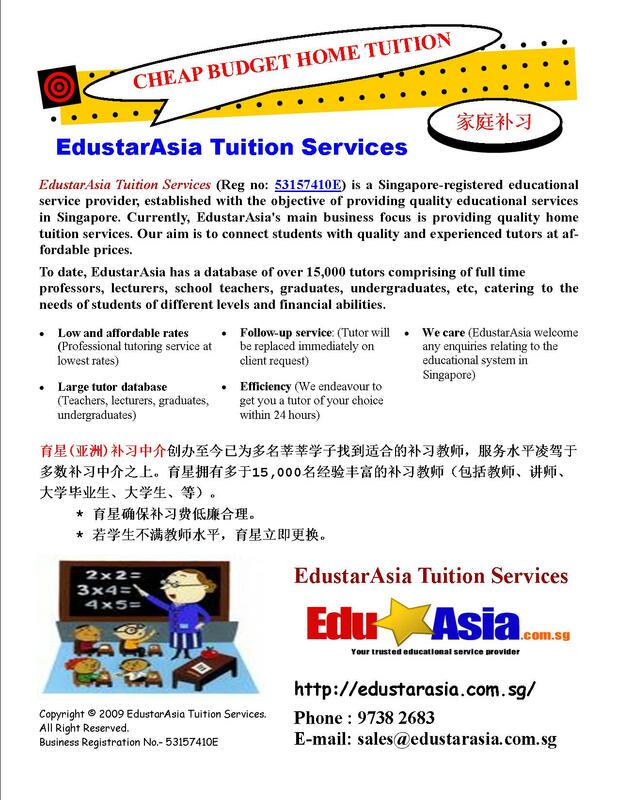 "The standard of tutors recommended by EdustarAsia is definitely much higher than other tuition agencies. I have been referred by my friends to this agency and I will refer it to all my friends!" 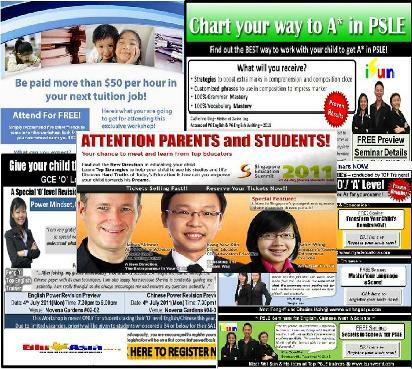 "EdustarAsia has changed my perception of tuition agencies totally." "Patient, friendly customer representatives who go the extra mile to meet my needs." "I have been thinking of finding a tutor for very long but was worried about the amount of tuition fees that I have to pay. Thanks to EdustarAsia for helping me find a good tutor with the limited budget I have!" They are satisfied with our services. You will be too. We guarantee!!! Request for a tutor now!!! EdustarAsia is collaborating once again with Edvalue to bring to you this intensive revision crash course that is tailored for students taking their PSLE/‘O’/’A’ levels this year in collaboration with 3 other top academic coaching centres in Singapore! We have install a series of FREE seminars where you and your child can attend to find out the “Secrets to score As for PSLE/‘O’/‘A’ level”. Seats are limited. 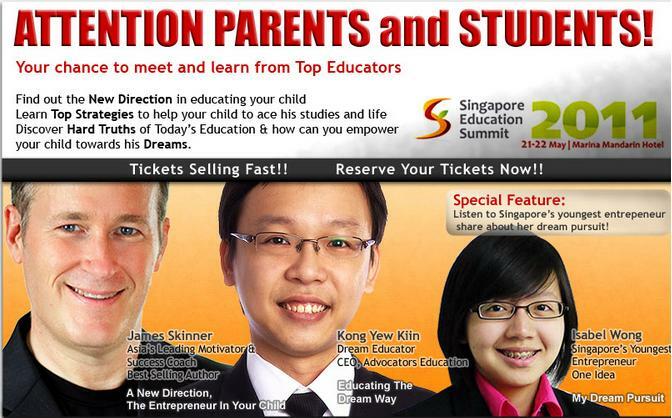 Last year, EdValue organised the Singapore Education Summit 2010 at Expo, we received an attendance of 1000 parents & students and received excellent feedback about the event. 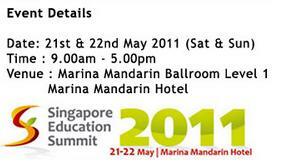 Due to the popular demand, EdustarAsia is collaborating once again with EdValue to bring you the Singapore Education Summit 2011 at Marina Mandarin Hotel on 21st & 22nd May 2011!!! 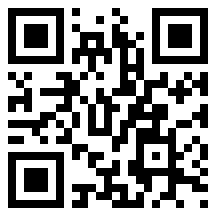 Or scan the QR code to get a tutor!! Free POPULAR vouchers for the first 100 successful clients!! Explore this interactive infographic for overview of the Singapore education landscape and the multiple pathways available to cater to the diverse aptitudes and interests of students! An informative website containing articles on parenting tips, educational news, information on the school curriculum and resources for parents to support their children’s learning and development. Information on all the schools in Singapore. You can also find out more about the schools featured at MOE ExCEL Fest! All you need to know about Primary School education in Singapore! Find out the latest education news, information for parents and features from schools and teachers.